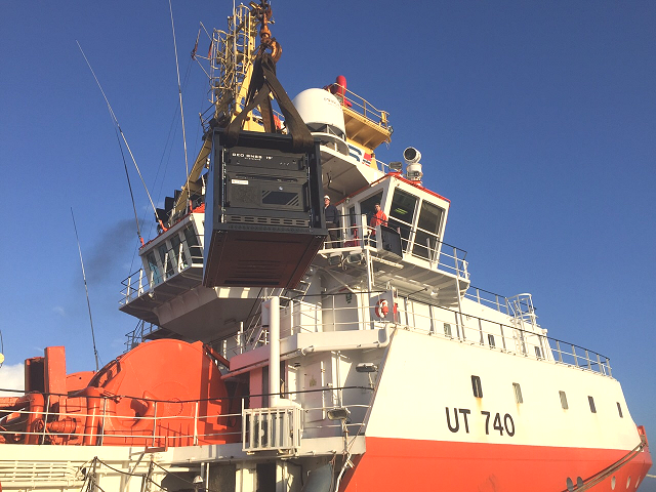 CT Systems has installed a complete Viking Offshore navigation system on board of the AHTS Offshore vessel M/V “Normand Atlantic”, owned by Solstad Offshore and contracted by Hydrotechnik Lübeck GmbH, adding to the growing list of vessels using Viking for offshore wind farm operations. Since the sea is a sensitive ecosystem containing many creatures worth protecting, marine scientists and conservation groups have been concerned about the extreme underwater noise caused by the foundation construction of the monopiles. Special piles of 55 meters long and weighing almost 200 tons each, are “hammered” into the seabed up to 40 metres. This “hammering” operation may cause significant underwater noise which could harm the underwater species. Hydrotechnik Lübeck, world’s leading experts in underwater noise and pollution reduction, invented a system called the “Big Bubble Curtain”. The “Big Bubble Curtain” operates in such a way that an offshore vessel, in this case M/V “Normand Atlantic”, will be equipped with special large hose reels and a cluster of very powerful compressors. Before the offshore construction jack-up platform, in this case the “MPI Discovery”, is brought into position, the M/V “Normand Atlantic” will lower the hoses onto the seabed, in a perfect circle around the building site. The Viking software and GeoGNSS high precision positioning system allows the vessel’s operators to exactly determine and visualize the location of the hoses on the bottom of the sea. Once the hoses are placed, the construction platform can be moved into its exact location. 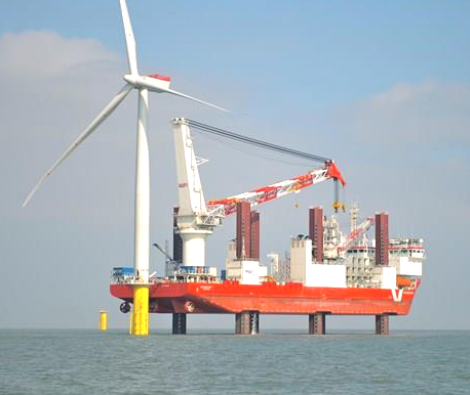 The “MPI Discovery” is a 135 meter long jack-up construction platform used for the placement of the monopiles. The platform or a tug can also be equipped with the Viking software and through a wireless data connection with the ‘hose laying vessel’, the required information such as position and location of the underwater hoses could be transmitted in real-time, allowing the platform to move to its exact location without losing any precious time. Once the platform is at its required location, and before it will start the actual pile “hammering”, the “Normand Atlantic” connects its onboard air compressors to the hoses and high compressed air is then forced through the hoses. The hoses contain small holes to create a noise-reducing “wall” made out of high density air bubbles formed around the building site. 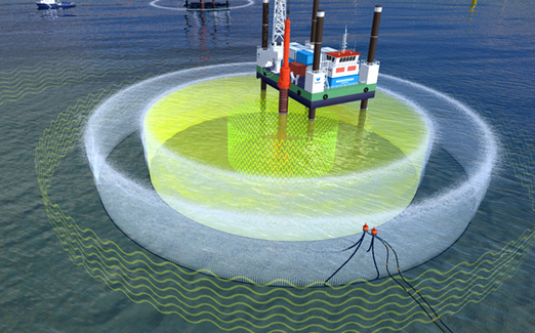 From the point when the construction platform starts with its pile “hammering” operations, the noise and floating debris will be stopped within the radius of the “air bubble screen” around the site, and avoid harming the surrounding underwater ecosystem. Viking software and positioning equipment was chosen for this special operation because of its already proven use for other specific Offshore operations such as Anchor Handling and Tug Management Systems (TMS), often also used in combination with wireless data transmission between vessels and/or construction platforms. At CT Systems we very conscious about any environmental related matters, and therefore we are proud to be able to provide our support with high technology solutions as part of this ecosystem.